Creating short video skits is fun and using a video app like VSKIT that showcases your creativity thereby bringing your imagination to life is amazingly relieving. Now, imagine a scenario where you get to be among the top talents to share a sum of 100 million naira, doing something you are passionate about. How cool is that? With VSKIT, it only gets better, as your favorite video app is creating a platform for recruiting quality video creators. Vskit is opening its doors to hopeful talents ready to learn the necessary skills to utilize their talents in the art of video creation. The successfully signed talents will have access to the sum of 100 million naira! 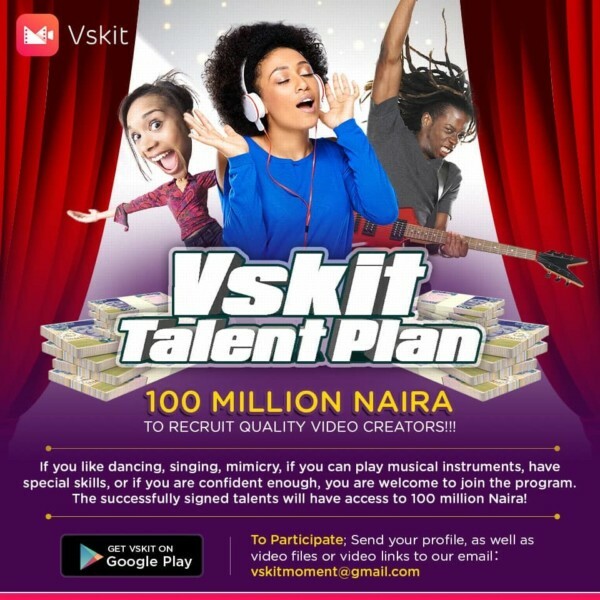 All you need do is; send your profile and video files or links to Vskitmoment@gmail.com or download the Vskit app on Google Play here for more information. So, if you love dancing, singing, mimicry, playing musical instruments or have any special skill and if you are confident in yourself, this is the chance to be a part of an amazing journey to discovering the beauty of video creation.